If you ask defense officials in Israel today for a short-term security forecast, chances are good that you will hear an optimistic outlook and an expectation of relative quiet and stability. Yet a longer-term glance at the next four to five years is less rosy, and suggests the approach of storm clouds, driven by violent, radical Islamic winds. That's why defense chiefs are keen to use the coming years to improve the Israeli military's readiness, build up intelligence and firepower capabilities, and improve civil defenses, while the "sun is still out." Recent public comments by security figures provide a glimpse into this long-term strategy. Speaking this week at the 2015 Herzliya Conference, which focused on the issue of Israeli deterrence, retired Maj.-Gen. Amos Gilad offered a mixed message: "Our security situation hasn't been so good in a long time. We are enjoying good deterrence on the northern front." Despite Hizballah's massive rocket and missile arsenal pointed at Israel, the Lebanese terror organization remains deterred by Israel. That deterrence is based partly on the country's firepower and ground offensive capabilities, and partly on the fact that Hizballah is entangled neck deep in the Syrian civil war, where it has lost an estimated 700 fighters trying to save its ally, the Assad regime. Following Iranian commands, Hizballah dispatched around 7,000 (of its 30,000) armed members to neighboring Syria, where they fight daily battles against the Al-Nusra Front, Islamic State, and other Sunni terror organizations. As a result, Hizballah's motivation for opening a new front against Israel has never been lower. Iran, too, is busy across the region. It is orchestrating the defense of Assad's dwindling regime, and has sent very senior military advisers to Syria to try to rescue it, injecting a constant flow of Shi'ite militias from other countries, money and weapons. But for Iran, the battle for Syria is already lost. The Alawites, backed by Iran and Hizballah, and who rule Syria through dictator Basher Al-Assad, make up just 10 percent of the population, while 80 percent of Syrians are Sunnis. The Iran-led axis is essentially fighting now to set up a statelet, made up of sections of Damascus, and a corridor leading from the Syrian capital to the west of the country, to the Latakia area that is the center of gravity for the pro-regime Alawite community. "I would like to announce the death of Syria," said Gilad, now the director of the Defense Ministry's Political-Military and Police Bureau. "Assad still gets a salary as president, but he governs a third of Syria. Southern Syria is under al Qaida; northern Syria is controlled by ISIS. There is nothing there and it has no future. Assad will continue to diminish." As the vacuum in Syria grows, radical Islamic forces – both Sunni and Shi'ite - move in to fill it. The Islamic State is expanding in Syria, but it is not getting closer to Israel's borders at this time. Hizballah and Iran already tried to build a terrorism base on the Syrian Golan, near the border with Israel, but an air strike in January foiled that effort. Meanwhile, to the south, Israel's enemies are also preoccupied. In the Gaza Strip, Hamas is busy rehabilitating its armed wing, restocking on domestically-made rockets, and digging new tunnels. Hamas is trying to take the pressure off itself and ease its isolation. It is keen to kick start civilian reconstruction programs after last year's war with Israel. Renewed conflict does not seem to be in Hamas's current interest, as it would disrupt its military reconstruction efforts and jeopardize its rule in Gaza. In fact, Israel is looking to help grow the Gazan economy, a development that could further restrain Hamas. Unconventional threats on Israel, meanwhile, are decreasing. Syria gave up its chemical weapons program, and Iran's nuclear program is temporarily frozen, though Tehran might be tempted to try to covertly break-out to nuclear weapons production. "The quiet is pretty amazing compared to all the turbulence around us," Gilad said in his speech. Maj.-Gen. (res.) Yaakov Amidror, the former head of Israel's National Security Council, attempted to answer that question in a major new paper he published at the Begin-Sadat Center for Strategic Studies, at Bar Ilan University. Amidror noted that forces that come from the "dark world of the choppy Middle East" are consolidating themselves on Israel's borders, replacing state actors. They include: Radical Salafi-jiahdis in the Sinai Peninsula and the first signs of Islamic State forces rising in this vast desert Egyptian province; the armed wing of the Muslim Brotherhood, Hamas, and its ally, Islamic Jihad, in Gaza, and Hizballah in Lebanon, which is "the strongest terror organization in the world. It is in possession of advanced military force, over 100,000 missiles and rockets, surface to sea missiles, surface to air missiles, and tens of thousands of armed, well trained fighters, some of whom have gained combat experience in Syria." Syria, Amidror said, is divided and ruled in part by extreme Sunni entities, while Assad's regime is kept alive by Iranian and Hizballah assistance (alongside quiet Russian help). "Israel is surrounded by terrorist organizations that have considerable offensive capabilities, from almost every direction. Their ability may not be the same as those of official militaries (Hizballah is the exception, due to its firepower capabilities), but because of their character, we must take into account the need to go from routine times to combat against them in a very short time frame, and without prior warning," Amidror cautioned. Israel will, in the coming years, have deal with non-state, armed, radical Islamic organizations that are gaining strength around it, he said. This development is part of a larger trend: The rise of radical Islam in the Middle East. Future rounds of fighting with such forces will almost definitely not be followed by peace, he predicted. Israel must be ready to engage terrorists operating in the midst of civilians who either support them or are indifferent to their presence. The very presence of these noncombatants complicates combat and harms the IDF's ability to act freely. Despite their differences, rivalries, and feuds, all of the radical Islamic groups have a common, fundamental attribute: They all believe that Islam must rule the world, Amidror said. Defense Minister Moshe Ya'alon, speaking to visiting Chairman of the Joint Chiefs of Staff Gen. Martin Dempsey on Tuesday, noted the existence of no fewer than "30 terrorist organization in Syria that we will have to deal with. They are not dealing with us now, and we are not involved in what is happening there, yet the moment can come when that will change. In such a situation, we must strike them with force." 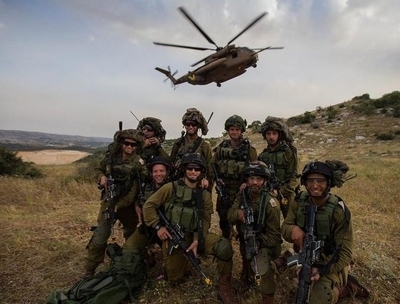 As a result, senior IDF officers say now is the time to focus on intensive training and building-up the power of the air force, navy, ground forces, and civil defenses. Now is the time to increase readiness, because in five years, many of these threats could bear down on Israel in a very direct way, according to the officials. The Israel Defense Forces, under the command of a newly appointed chief of staff, Lt.-Gen. Gadi Eisenkot, has begun to train in earnest. The Israel Air Force is in training to increase its ability to strike all of Hizballah's known targets – thousands of them – in just four to five days. Navy and ground forces have to be able instantly launch large-scale operations. The entire military must prepare for multi-front conflicts, with an emphasis on northern battle arenas – Lebanon and Syria. All IDF units must improve their combat skills in built-up areas. Reserve military forces have begun training for two straight weeks – double the previous training times. In the coming year, the reserve units will be free of operational missions, to enable them to focus purely on training. The IDF is stocking up on advanced Namer armored personnel carriers, and Merkava Mk 4 tanks, both of which come with active protection systems against missiles and mortars, enabling them to safely travel into Hizballah or Hamas-ruled areas rife with shoulder-launched missile ambushes. With cyber-attacks becoming an ever-increasing threat, the IDF might launch a new cyber warfare division in the coming months. In the long run, the most dangerous threat, however, remains Iran, according to the Defense Ministry's Amos Gilad. "Iran is like a Greek god with two heads," he told the Herzliya conference. "One says it wants negotiations [with the West], the other is working to build a Shi'ite empire," he said. Therefore, Israel must prepare for the potential of direct confrontation with Iran, too.